You are here: Home / Personal finance / Is financial infidelity worse than cheating? Is financial infidelity worse than cheating? Nearly one in five adults surveyed (who were in live-in relationships) admitted to hiding a checking, savings or credit card account from their partners. If you’re a millennial then the news is even worse: 28% admitted to having a secret account, compared to 15% of older respondents. I truly don’t get how this is possible. Maybe it’s because I was in complete control of our finances. All of the money that came in went directly into our joint account. I checked our bank balance routinely, so I’d have noticed money being withdrawn and I always noticed money being spent if I hadn’t okayed it. I suppose some couples have a small amount of discretionary income, which they could use to make minimum payments on a secret credit card. But unless you have separate finances, I truly don’t understand how you could have a secret bank account. Wouldn’t the partner notice if the full paycheck wasn’t coming into the joint account? And if you have separate finances, what’s the point of a “secret” account? I guess my other question is how you hide the results on the spending. Sure, you can spend on experiences, including something as mundane as eating out. But wouldn’t the partner notice that you didn’t brownbag it that day (or that you brought home your lunch uneaten)? Or would you actually throw away perfectly good food to hide the fact? Or are we talking drinks out with friends, then lying about how much you indulged? Also, I suppose there’s fashion. A lot of guys don’t know what women’s fashion costs, so you could argue that women can get away with downplaying the cost of new attire, makeup, etc. Still, wouldn’t the partner get suspicious when the charge didn’t show up at all on the joint card? Maybe these are the people who have let their partners take the financial reins and therefore don’t check the card charges as carefully as they apparently should. Which is a terrifying idea in its own right. According to the article, one of the main reasons people hide accounts is to avoid conflict. They know that their partners wouldn’t approve of the money spent, and they don’t want the argument. Theoretically, I get that. But that tells you one of two things: You know you’re not spending your money wisely, or you and your partner have different money priorities . Neither one is great for a relationship’s future. Tim and I had different money philosophies, and it was a near-constant source of friction because money permeates so much of life. It ultimately led to a lot of resentment — and some of that resentment is what led to the divorce. So if you and your significant other have different money values, it’s time to have a long, hard talk to get more aligned. Or potentially to realize that the differences are going to cause too much trouble long-term. Sad but true. Perhaps the most interesting parts of the results were the reactions by the would-be cheatees. When asked, 55% of the respondents said that having an account hidden from them would be as bad or worse than physically cheating: 35% thought it was as bad, 20% thought it was worse. Would that really be the case? I initially thought that was a bit hyperbolic. But then I pictured how I’d have felt if I’d found out Tim had taken out a credit card behind my back. If suddenly we had once again been in credit card debt because he couldn’t be bothered to spend wisely. Of course, that couldn’t have happened. As previously stated, I dealt with all of the finances (a setup Tim was infinitely grateful for, I should add). I saw all the charges on the credit card and routinely checked the bank accounts to monitor our spending activity. There would have been no way for him to even meet the minimum payments without taking money out of our joint account, which I would have noticed. Still, what if he had managed it somehow? I’d have been devastated and infuriated. And yes, I’d have felt betrayed. Still, would I have thought it was as bad as/worse than cheating? Probably not… I think. Because another part of me thinks perhaps it would have been worse. Hormones can lead you astray, making quick, stupid, one-time decisions — albeit ones with a long-lasting impact. Meanwhile, a secret account is a choice you make over and over again. It’s a continuing action to hide something important and potentially life-altering from your partner. So yeah, maybe it is as bad as traditional cheating. I know of one man who found out his wife had taken out a credit card in her own name and had multiple thousands of dollars of debt. He’d thought they were financially stable, but it was an illusion. I try to picture that kind of revelation and how devastating it would be. But I just can’t imagine. I wonder if he felt cheated on. Do you think financial infidelity is worse than regular cheating? 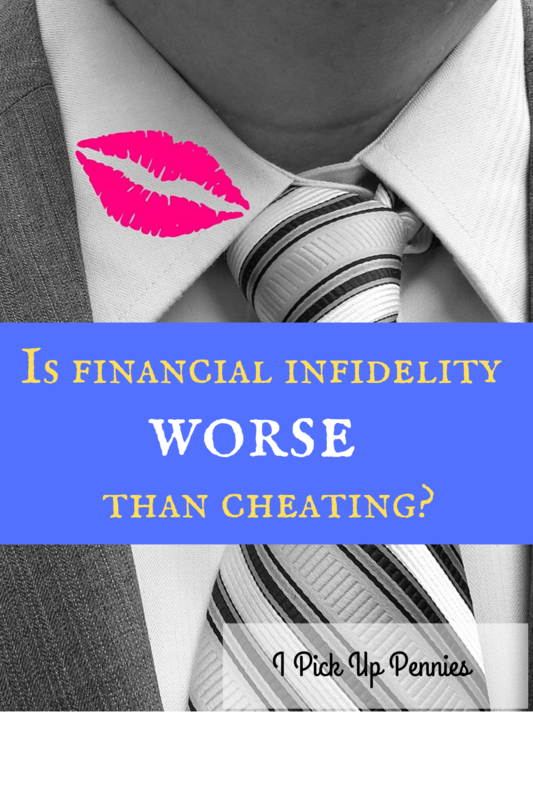 Have you ever experienced financial infidelity? My parents split in part because of financial infidelity, which included the taking out of a second mortgage and silently dropping our health insurance to fuel a gambling addiction. It’s pretty easy to have a secret account if you control the overall finances, or if you play the 0% interest balance transfer game between multiple cards in your name. I would definitely be angrier at financial infidelity than regular cheating. Wow, how on earth did they secure a second mortgage without their spouse knowing? Was the original mortgage only in one name? And yes I suppose if you control the overall finances, it would be easy to hide things. I guess it just flabbergasts me in this day and age that people really let themselves be ignorant of their overall finances. Even when Tim had completely ceded control of our money, I kept him updated so that he was in the loop. I’m so sorry to hear about the gambling addiction and all that it caused. I hope you’ve been able to heal over time, as that sounds rather traumatic for a kid to go through. It’s something Tim couldn’t have done to you, but could you have done it to him? Lots of people say “oh you handle all the money” and hand it off to the other person. When my partner and I were having lots of money conflict, i was also handling all the bills. The day I was paying the credit card bill and I thought “I could just spend what I wanted, he never looks at this” is the day I started making him do half of the financial chores, to take that temptation away. Yep, looking back I absolutely could have done it to him. It just never occurred to me, of course, because my goal was to save, not spend. So it doesn’t even (initially) occur to me when I read stuff like this that I could have been the one who perpetrated this type of behavior. Jake insisted on separate finances (despite the fact that AZ is a community property state, which renders that decision meaningless). After he was fired from his job, he opened his own firm. I thought it was solvent, but just before the divorce I found out he’d run up $30k in credit card debt and hadn’t filed taxes in 2 years (we also filed separately). Thank god I got out. My husband lets me handle all the finances as it doesn’t interest him at all. He has access to all the accounts but I don’t think he ever logs in. I do tell him periodically what I have been doing with our finances so he’s not completely out of the loop but it would be very easy for me to hide money if I wanted to. The other day he was rattling off our debt and I’m like “yeah I already paid that off where have you been?” 🤣 he always thinks we have no money and I have to remind him that we have plenty. Wow, Tim at least knew when we paid off our debts. Then again, I made a huge deal about each one, so maybe it stuck a little better for that reason. And yeah I suppose if the spouse is that disinterested, it’s easy enough to rack up debt without issue. I could have racked up tons of debt without Tim knowing, but I guess that just didn’t occur to me when writing this because that’d be so antithetical to my personality. As the money controller, I could EASILY fork over PiC and run up debt in his name and all that nastiness because he doesn’t have a day to day view of our finances but I can’t possibly think of a compelling enough reason for me to do such a horrible thing. It’s about our foundation of trust so I wouldn’t say that either of them are worse than the other. They are both very much horrible dealbreakers. Lying repeatedly is the same as infidelity to me. It’s all lying and hiding things and betraying the trust you have with the other person. No amount of money or stuff could be worth throwing that away. Yep, it comes down to the fact that in each case it’s a betrayal of basic trust, and trust is one of the hardest things to win back once it’s gone. So I can kind of see why some people would rate financial infidelity as being the same as regular infidelity. I could fairly easily see how this could happen. For example, my ex and I had a joint account where a portion of our incomes went to cover bills and shared savings. We also each had our own accounts for our own spending. To this day I do not know what accounts he directed that money to and he does not know what accounts I directed money to. That’s true. I always forget about this setup when thinking about finances because it’s never been my experience. I’ve always basically had to manage the finances, so I forget that some people have a yours/mine/ours setup. In that case, it’s fairly easy to see how someone could rack up debt without the other person knowing. Though if you’re unmarried and have at least mostly separate finances, I’m not sure whether any credit card or account should count as a “secret” one. But that may just be splitting hairs. People’s 401ks, IRAs and HSAs are all in only one person’s name, even if they’re married. I have a friend whose husband developed an addiction and emptied out all his retirement savings – she only found out at tax time, when he came clean about it. But it was too late to do anything about it. They’re divorced now. Good point! I guess I didn’t think about raiding your retirement accounts because it somehow seems even more self-destructive than secretly building up debt. Several things led to the collapse of my marriage after many years, but financial infidelity was the first major crack that eventually grew into quite the chasm. All our accounts were set up (as was advised in the 70s when we married) as Husband OR Wife, which gave us equal access to any account, so when he began draining our retirement funds, it was not illegal and I had no recourse. Why did I not realize it right away? Because in the 30+ years we had been married he had never, ever been less than forthcoming about money he spent. By the time I realized what he was doing, the money was gone, never to be recovered. Yes, I have beat myself up for that many times and I still feel stupid, but it is what it is. We divorced and I doubt that I will remarry, but I do know that I will never, ever comingle finances with anyone ever again. I’m so sorry you had to go through that. I can see why you’d trust him so implicitly if he were forthcoming in all other aspects. I can’t blame you for not wanting to remarry. My sister helped her ex fiancé, then husband, write a thesis for his Masters degree. Turns out he wasn’t even going to school … he was moonlighting to pay for her (very modest) engagement ring, plus a bunch of other debt she knew nothing about. Wow, that’s insane! I’m glad she got it annulled, since that was probably cheaper than a divorce. Did it absolve her of any part of this debts? As others have pointed out here, like any type of infidelity, financial infidelity is, fundamentally, an issue of compromised trust which will serve to erode any relationship. So, I am not surprised that the results indicated that most saw it equal to or worse than physical infidelity. However, if both parties are actively engaged in managing the finances, I agree that it would be tough to conceal. Yep, a breach of trust is very difficult to repair. I know some couples get past it — either financial or physical infidelity — but I’m not sure I could on either count. It’s just too hard to make yourself that vulnerable again after you’ve been burned, I’d think. Luckily, I’ve never had to find out how I’d react. I hope I never have to. Wow, that’s a pretty dickish move by the husband. And definitely the wrong way of doing separate finances. Things like car repair should come out of the joint funds for sure. I guess I can see why it’d be more prevalent in the military — on both sides. I believe I also heard of a case or two of the wife dealing with the finances while the guy was deployed and running up a ton of debt. So I suppose that’s another way this sort of thing can transpire without one spouse knowing. I think financial cheating can be as bad as physical cheating, but it depends on what it is. I don’t ever see myself having a secret credit card, secret debt, or hiding large purchases, but I could see myself having a small secret savings account my theoretical SO knew nothing about, just to have some extra money just in case. Especially if my SO was not as into savings as I was. But this is theoretical, since I don’t have an SO to share finances with. Interesting. I don’t think I could hide any accounts from an SO, assuming a live-in relationship. But I guess never say never because you can’t say until you’re in the situation. Of course the likelihood of my going back to a live-in situation is pretty dicey anyway. I’ll worry about that if I start dating someone in earnest, which won’t be for a while. I knew a guy who tried to cheat his wife out of their mutual savings in the run up to their divorce by changing the mailing address for the statements (snail mail days) to his sister’s house. I guess he had moved money to accounts in his name only and literally hid it. All I know of the outcome is that the divorce was long and bitter. No surprise there. I guess that’s why lawyers hire private detectives to look into the spouses. You get a sense of their finances and maybe find out anything they’re hiding. This really blows my mind because I would think cheating with another person was way worse than financial infidelity, if I was going to try to make the marriage work. It would be easier to walk away if they cheated on me. Then again, I stressed a lot about what being connected with my ex would do to my finances, and I remember when we first got together- I went straight to work on his credit (which was trash). It helped him in the end, and screwed me over. But I was also in control of the finances and could have royally screwed him over if I had wanted him to. I didn’t, but I could have filtered tons of money away if my divorce from him had been planned out in advance. UGH. Just glad to be out of that whole relationship. I think those of us who were in charge of the finances have a harder time wrapping our heads around financial infidelity. At least, those of us who were honest enough not to perpetrate financial infidelity ourselves. Because honestly I doubt it ever occurred to you. I know it didn’t to me. So the idea of hiding debt just blows my mind. I’m glad you’re out of the whole thing too, but I’m sorry you got screwed over in the process. My first marriage ended with financial infidelity and talk about feeling stupid! I thought we were fine and working our way to having some assets and money. He had a P.O. Box with his bills from 4 different credit cards going to it….I had no idea! He didn’t have material things he had a major gambling problem. When getting our divorce I found out he owed family/friends about $15K too! Looking at $45K in debt over gambling! It was a true problem of his and he blamed me. I ran and took on all responsibilities of the house we had, car with a loan and 2 kids. Financial infidelity is done because you and your partner are not on the same page! My ex-husband also had a secretary that was there to catch him falling……so financial infidelity is just more than a money problem! I’m so sorry that you had to go through that. I’m glad you got out, even if it sounds like it was scary and painful! I hadn’t considered the gambling (or other addiction) issue. That could definitely explain how spending isn’t noticed by the other party. And I agree: financial infidelity is a bad sign that you and your partner just aren’t on the same page, whether due to addiction or simple money priorities. I guess it would have to depend on magnitude. Five figures of debt or more is probably worse than one drunken night of bad decisions. But either way, not something I’m sure you can come back from very often. Yep, I think any kind of infidelity leads to a breach of trust that’s incredibly difficult (if not impossible) to repair. But you’re right that the magnitude would play a part. If we’re talking $1,000 of debt, I’d be pissed but I’d get over it if being a little wary in the future. But five figures… That’s not necessarily something I can forgive. I haven’t to my knowledge been cheated on but I would say have experienced financial betrayal, and I’ve definitely thought it could be comparable. At least by my personal values I think it would be worse than a one off incident (a prolonged affair, dunno, different story). Good point, an ongoing affair would obviously be different from a one-time thing, and therefore maybe less comparable to financial betrayal. On the other hand, financial betrayal also tends to be something done on an ongoing basis. It’s hard to know for sure how much I’d compare it to actual infidelity unless I were in the situation, which I hope never to be! I’m so sorry that you had to go through any version of infidelity, even if it was financial rather than physical. I’m just stuck on the 1 in 5 people in live-in relationships do this! Thinking through our circle of close friends, that means 2-3 of them are doing this. This absolutely blows my mind. But, if I think about it, I bet I could guess which people are insecure enough to do so. It’s a scary thought, isn’t it? That people you know could be doing this to their partner? Yikes! But I guess statistically speaking it’s likely. I have a friend who has entirely separate finances from her boyfriend, but he at least knows her entire financial situation. So if anything, he’d be the one that’d hide stuff from her. But like me she’s obsessed with personal finance, so I suppose she’s pretty on top of his finances too. This is pretty wild – I didn’t know these stats and some of the stories in the comments are pretty awful. At my old hospital we could do direct payroll deduction for purchases at the cafeteria and gift shop. I remember several people in my office making jokes that they would buy things at the gift shop and their spouse would never see it since they only saw the check hitting the bank (not the deduction). Maybe these weren’t jokes! I hope they were just jokes! But there’s a chance that a few of them were serious and just trying to make it sound funny to hide their duplicity. That said, the system you’re describing sounds like a pretty insidious one because the cafeteria purchases could add up pretty quickly if you don’t have the emotional impact of forking over cash every time you want to eat there. I hope you didn’t get sucked in too much!